Winterizing perennials should be done before the ground freezes solid. Perennials require some protection from the elements as well as basic maintenance to keep them healthy. Spend a bit of time winterizing perennials now for gorgeous blossoms next spring. Winterizing perennials consists of several basic steps. Before tackling this garden task, you'll need a sharp pair of garden pruners, a wheelbarrow or bucket, a shovel or spade, and the mulch of your choice. After the first frost, perennials naturally begin to die back. Take your garden pruners and snip away dead leaves, stems and flowers. Remove them and place them in the bucket or wheelbarrow, then discard them in the trash. Do not compost them. This step removes garden debris that can harbor disease-causing microbes or insects sheltering under the dead plant material. The second step in winterizing perennials requires a rake. Gently rake near perennials if fallen leaves cover the garden. For the same reason dead leaves and stems are removed, raking fallen autumn leaves also removes potential shelter for insects and their offspring. Be sure to rake gently, however. Many gardeners accidentally rake up their perennials, too, when winterizing perennials. Use the mulch of your choice and place a thick layer near the plant. Most perennials do well with one to three inches of mulch, but check in a good plant book to determine the proper mulch depth for your perennials. Winterizing perennials with a good layer of mulch is critical for gardening success. If you have perennials that die back to the ground completely, you may want to place plant markers or stakes near the crowns of the plants. Otherwise you could accidentally dig them up in the spring when you plant your annuals. If you have a few more weeks of mild weather, you can divide perennials such as daylilies and iris in the fall. However, if you've already had a few frosts, it may be better to wait until the spring. Dividing in the fall is generally a good idea, but plants do need a few weeks of mild temperatures in order to set down new roots. Wait until spring for best results. Roses require special treatment and care. Rose bushes should be trimmed, and a thick layer of mulch or soil mounded up near the center stem or cane. This protects the major portion of the plant where new shoots grow from winter storms and cold. Climbing roses also require special care, including removing the climbing canes from their supports and wrapping them, if possible. Winterizing perennials is critical for their health and well-being. Mulch, for instance, not only helps maintain moisture levels near the plant's root system; it also prevents freezing and thawing of the ground close to the plant. When the ground freezes and thaws repeatedly, it can actually heave or rise up, disturbing and damaging roots. Mulch keeps the temperature even and stable. Garden cleanup, the first step in winterizing perennials, is also essential. Many insects hibernate and take refuge under decaying leaves, or lay their eggs in similar areas. By raking up and discarding fallen leaves and snipping back perennials, you remove potential hiding places for insects. 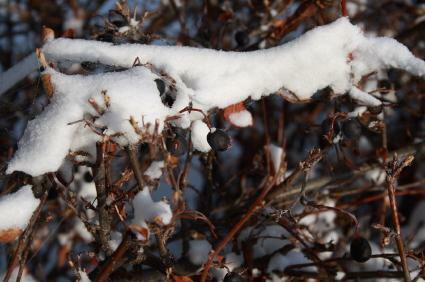 Pruning perennials in the winter also protects the plant from damage due to snow and ice. If branches and stems are cut back, there's no place for ice to take hold and snap tender branches. Ideally, winterizing perennials begins in early to mid fall, but unless the plants are completely covered with snow, you can tackle this important garden chore as soon as you are ready.